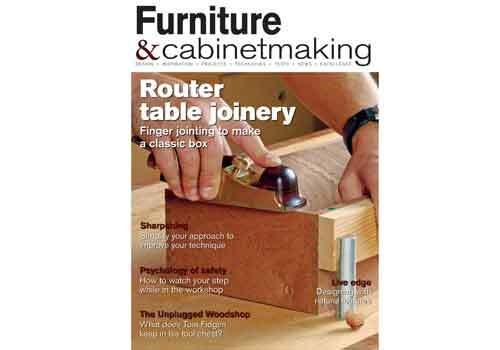 In issue 225 of Furniture & Cabinetmaking we have lots for you to enjoy. In our 'Projects & Techniques' section Tom Fidgen discusses the hand saw; Charles Mak makes a Krenov-inspired cabinet; Brian Greene shows you how to be a better sharpener; Marco Terenzi makes the hardware for his miniature Anarchist's Tool Chest; Derek Jones completes the finger jointing exercise; Geoffrey Laycock explores the psychology of safety, and we look at the new range of circular saw blades from IRWIN Marples. In 'Design & Inspiration' we spend 20 minutes with Chester Shuey; we meet Austin Heitzman, who tells us about the inspirations behind his work; John Lloyd reports back from his latest teaching trip; Hendrik Varju gives us the lowdown on the 2014 International Woodworking Fair and we look at the contents of a Grand Milanese apartment and a Genoese villa, which recently sold at Bonhams for Â£2.4 million. As well as all this, we also have 'Leader' from the Editor; 'News & Events'; 'F&CUK'; 'Editor's round-up' and 'Workshop library'. Did you know that you can also download a digital copy of the magazine for your iPhone, iPad or Android device and save up t0 42%! Find out more here.